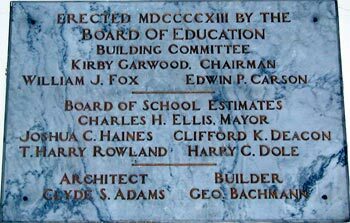 In 1913 the Eastside Elementary School was built in the 2800 block of Mickle Street, during the administration of Mayor Charles H. Ellis. 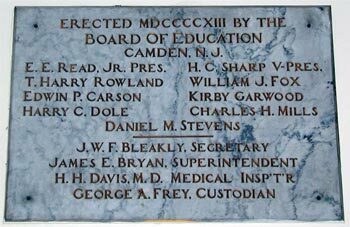 During this time, under the guidance of Camden's longtime Superintendent of School Dr. James E. Bryan, a great many new schools were built in Camden. 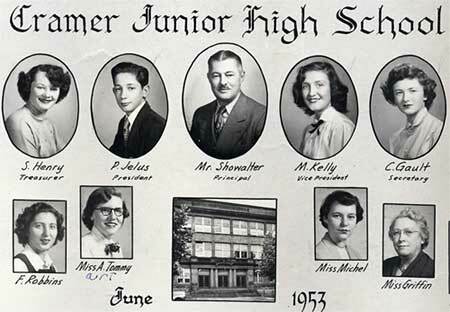 As the population in East Camden began to grow, and as more children were remaining in school as opposed to entering the workforce at an early age, this building became a junior high and was renamed Alfred Cramer Junior High School, in honor of Alfred Cramer, an innovative real estate developer who made it possible for working class people to buy building lots by paying in installments. He was responsible for much of the development in East Camden and of course, Cramer Hill, which bears his name also. 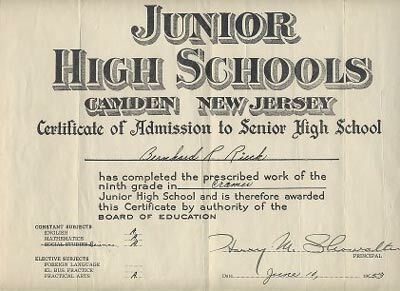 As a Junior High School, most of the children attending public schools in East Camden went to Cramer. 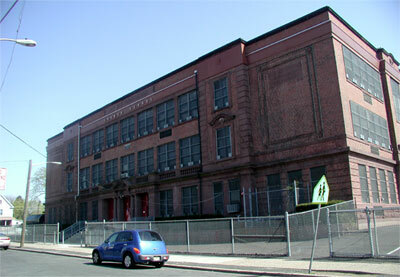 In 1930 Woodrow Wilson Junior High School opened up on Federal Street, and Cramer became an elementary school. In June of 1933 Dr. Leon N. Neulen, then Camden's superintendent of schools, announced that Woodrow Wilson would become a high school and that Cramer would once again be a junior high school. This plan went into effect in September of 1933. 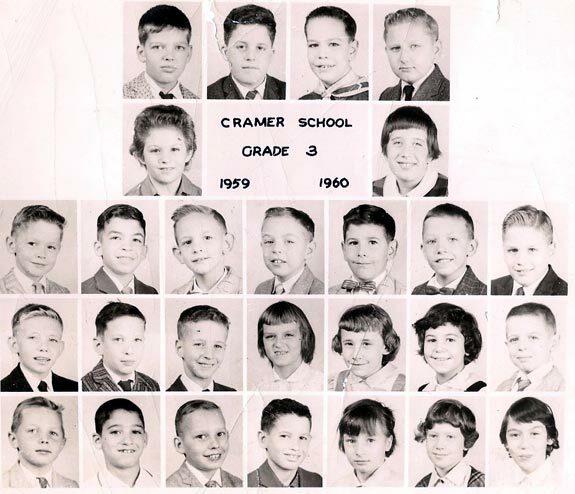 Around 1957 Cramer became once again an elementary school. Since that time, Cramer has gone through many renovations and changes. Presently, Cramer is a Pre-K to Grade 4 Elementary School, with a full day pre-kindergarten and kindergarten program which emphasizes language development, positive self-image, and early reading activities. The Cramer School has also served the immediate community for many years as a polling place when elections are held. 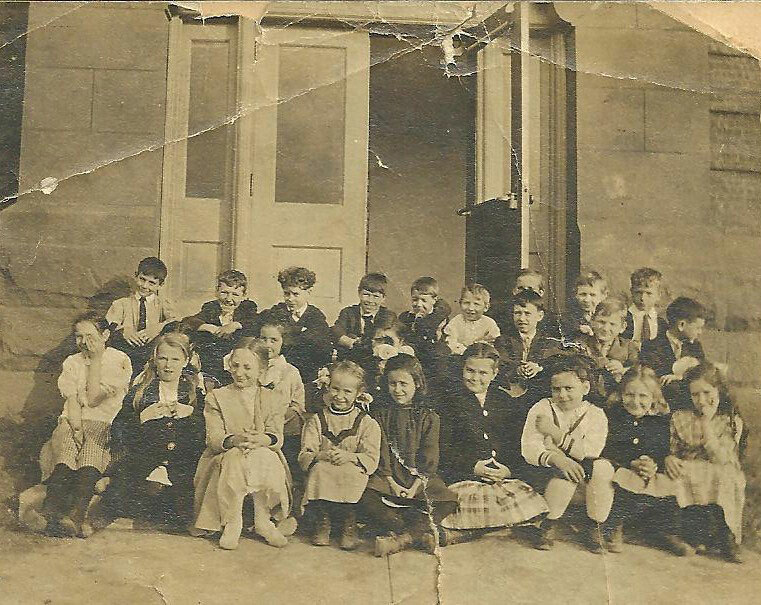 ".....an old class picture from my grandmother, Betty Ogle Laird, at Cramer School, probably around 1915+/-. 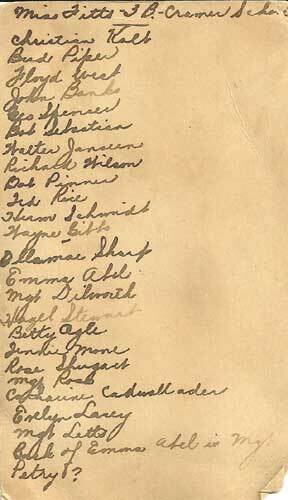 I have also scanned the back of this picture ("class list"). My grandmother is the fifth from the left in the front row, following the list from the back of this picture. It also says "Miss Fitts 3B Cramer School" at the top of this list. "...... my dad, Wayne was the young fellow on the end looking off to the left. I had to get my brothers in on the ID." "Back of Emma Abel is Margaret Petry?" An exhibition and demonstration of the years' work in all grades wi1l be held today in Cramer School. The program, arranged for parents and friends of the school, will start at 2.30 p. m. Refreshments will be served after the demonstrations. Pupils of Cramer School, Twenty-ninth and Mickle Streets, demonstrated their work yesterday afternoon to more than 300 parents and friends, under direction of Miss Elizabeth A. Mathews, principal. Children of the Second Grade exhibited Swiss handicrafts and art. A Swiss play and song were presented by pupils of the Second A class. They were coached by their teacher, Miss Elizabeth Mowers. English- Mary G. Dankor, Dorothy G. Dankor, Dorothy Milhous, Evelyn W. Heinold, Emily W. Smith, Ida L. Harman. Social Subjects- Edith Tietelman, Joseph W. Knouff, Charles D. Jones. Science- Mabel A. Rockhill, Florence C. Davis, Alan B. Henderson. Mathematics- Kay S. Witmer, Cheaster L. Witmer, Chester V. Kopuenhaver, Ida Berger, Mildred M. Stoner. Practical Arts, Girls- Florence Pratt, Martha Bishop. Physical Education and Health- Mary F. Ladewig, Frank E. Sias. Chords that helped youthful voices stay "in tune" for 25 years at Cramer Junior High School departed on a a piano manufacturer's truck the other day. The school has bought a new piano. It is a rebuilt grand, replacing the instrument which had been in use in the school auditorium since pre-war days. The school itself has assumed the responsibility of meeting payments on the piano. An entertainment by Morton, the magician, and his trick dog "Onyx," who reads your mind better than you can, will be presented in the school auditorium next Wednesday afternoon. The school will earn a commission on each ten-cent ticket sold, and proceeds will help pay for the newly acquired piano. Ralph Smith, electric shop instructor, is in charge of tickets, which have been distributed through homerooms. Some sew this way, some sew straight up and down, and they all sew pretty little dresses for the Camden Needlework Guild. The Guild supplied funds for materials, and, working with their sewing instructor, Miss Maude Griffin, eighth grade girls, in their regular course, and ninth graders, for whom sewing is elective, are making new clothing. The frocks are cottons, in pretty colors and prints, in sizes 2 to 12. They will later be distributed to needy persons through the Guild, which is a branch of a national service. Thelma Selby, new desk clerk of the traffic organization, has about the unit's biggest job to handle. She manages the traffic room, where officers check in and out, metes out badges to fellow officers, does all recording, catalogues lost and found articles and returns them when claims are proved, authorizes passes for parking bicycles in the school courtyard and for parking skates in lockers. The bringing of bicycles and skates to school used to be quite a noisy problem before the pass system was instituted, according to Fred W. Bergmann, who has charge of traffic. New heads of the traffic system of this term are Thomas Stewart and Doris Schellenger. Traffic posts throughout the building rotate every week, so every student officer gets practice handling moving crowds in each spot. Betty Long is president of the traffic club; Sarah Lins, vice president; Edna Crim, secretary and Violet Morgan, treasurer. 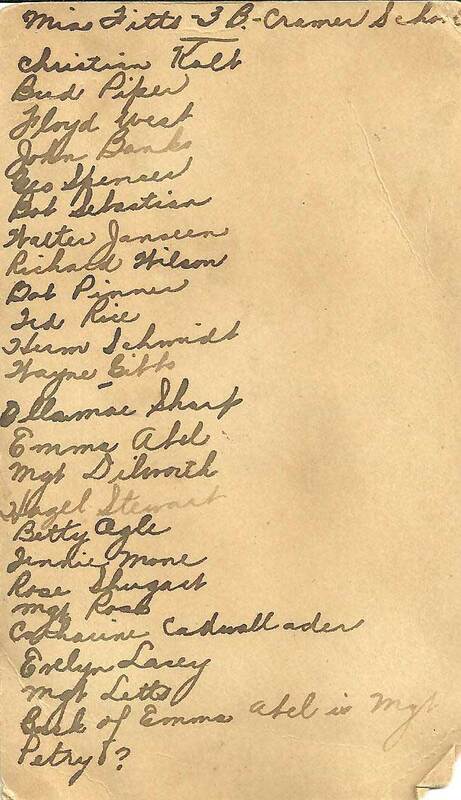 Active in affairs of the organization, which is a school government by representative students, are Thelma Cook, Miss Crim, Miss Morgan, Virginia Leigh, Earl Idell, William Leon, Gordon Wells and William Robbins, who serve as ushers in assemblies, and Miss Lins, Miss Long, Margaret Hurff, Marie Heide, Jane Selfridge, Florence Donahue, Alberta Walker, Ruthe Pogust, Ella Czernaik, Dorothy Sanders, Elizabeth Yonkers, Reinhold Selm, Paul van Horn Victor Miduzewski, George Henry, Frederick Meidt, Raymond Oriol, Charles Miller, Harry Chamberlain, Francis Clark, Joseph Gaughan, Harry Parker, Leon Heffelfinger and Harry Baker. 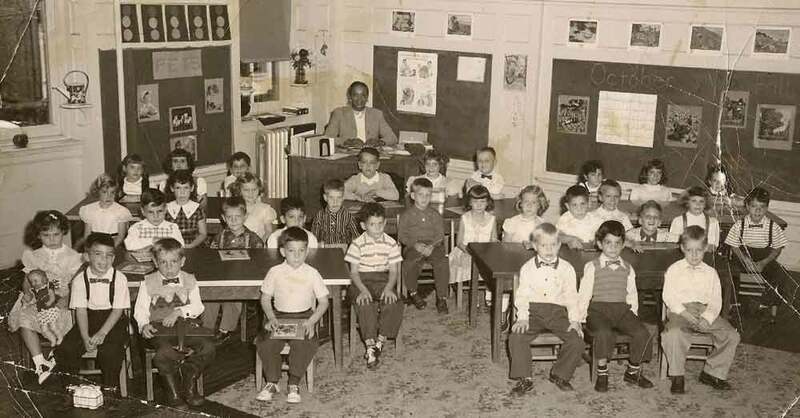 The school received a $150 allotment of books from the Board of Education in September, 1934, and $200 a year later, but has no furniture to organize a school library. Reference books for teachers are kept in room 309. So that Cramer students need not miss any of the collected treasurers tucked a way in closets uncatalogued, Mrs. Maryland Danker has a club for boys, and Miss B. Lucille Doerner, one for girls, through which members may read the books in club period Tuesday afternoons. Miss Elizabeth Dickinson, of the faculty, has organized a new game club for girls. Monopoly, checkers and bingo are among the diversions. James Foley, also of the faculty, is guiding the precise-minded lads enrolled in the cryptogram and math puzzle club. They make and exchange grams and puzzles. Miss Emily Rochill sponsors a progressive game club for boys this term. Members are divided into quarters and progress from one type game to another each club period. Ten cents dues are required so an assortment of games for progressing can be acquired. A piping hot stew, generous with brilliant vegetables and a crisp salad were on the menu for teachers Tuesday, served by home economics classes. Once weekly, classes cooperate on an actual project and prepare similar hot lunches. Twenty 9A girls and 12 8A's work with Miss Florence Pratt, their instructor, in this no-profit plan. The older girls, who have class earlier, make the dessert, which usually takes longer, according to Miss Pratt. The 8A's take care of the hot foods, and acquire a knowledge of correct table setting and serving by doing it for their teachers under Miss Pratt's watchful eye. Cramer- Founder's Day will be celebrated at the regular meeting tonight. Mrs. Wilbur Peters is the chairman. Those taking part are Mrs. Harry Tueber, Mrs. Fred Miller, Mrs. Edith Greenwood, Mrs. William Gridley, Mrs. Arthur Fichter, Mrs. Mildred Simmons and Mrs. William Rowntree. Luncheon was served to teachers on Friday and Monday. The committee in charge was Mrs. W. Rowntree, Mrs. F. Creager, Mrs. C. Martin, Mrs. A. Fichter, Mrs. W. Peters, Mrs. W. Read, Mrs. J. Hock, Mrs. R. Abbott, Mrs. S. Clayton, Mrs. R. Schaeffer and Mrs. C. Landenberger. speaker at the Garfield School, Camden, P. T. A. meeting: last night. Broadway — Mrs. Ralph Jones, county magazine chairman, was the guest speaker at the meeting Tuesday night. A playlet in commemoration of Founder's Day was presented by a group from the Northeast-Sewell association. Mrs. Thomas Melchore presided. Mrs. George Lee, welfare chairman, has made arrangements for an industrial tour on February 21. Mrs. Walter Gross attended the meeting of the Home Demonstration Extension on Monday. Mrs. C. Fred Becker, parent discussion group leader, is holding a meeting in the school on Tuesday at 1.30 p. m. A donation of $1.25 was approved to be given the recreation committee toward the New York trip of the winners in the sewing contest held recently. Cooper—Health night was held at the regular meeting Monday. Mrs. G. Kramer, county health chairman, spoke on the importance of correct food for children. A play was presented by the Seventh grade English class, under the direction of Miss E. Hanna. A violin solo was rendered by Miss A. Claypool, accompanied at the piano by Miss V. Merwall. An educational trip has been planned for this afternoon at 1.30. 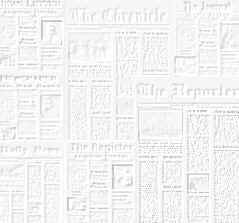 Cramer — The county president's message echoes from the release were read by Mrs. William Rowntree, president, at the meeting last week. 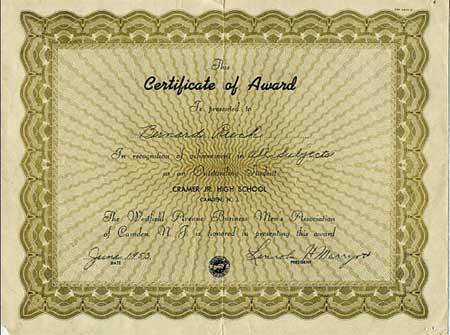 A gift of $1.25 was sent to the committee on the Doll Dressing Contest. Mrs. Arthur Fichter, membership chairman; Mrs. Fred Creager, welfare chairman, and Mrs. William Rowntree, president, attended the city group meeting last week. The executive committee will meet at the home of Barney Brown, vice president, 2566 Baird boulevard, on Tuesday night at 8 o'clock. The association is sponsoring a three-act comedy, "Here Comes Charlie," to be given by the Queen Esther Society of Asbury M. E. church, on Thursday night, February 17, at 8 o'clock in the school auditorium. H. H. Davis—Members of the discussion group met in the school yesterday under the leadership of Mrs. William Allen, discussion group chairman, followed by rehearsal for the Founder's Day play arranged by Miss Kathleen Willetts, Founder's Day chairman. A candle lighting ceremony will also be given in observance of Founder's Day, at the meeting Thursday. Calvin Chambers will compile the publicity record book to be displayed at the annual luncheon. A trip to an industrial plant is planned for next Wednesday afternoon. A bus will leave the school at 1 p. m.
Dudley—Mrs. Elizabeth James and Mrs. Sarah Miller who were in charge of purchasing of basketball suits for the school team, reported that donations of $10.65 have been received from business people and friends. The executive committee has approved sending $1.25 to the Recreation Commission toward the New York trip for winners of the Doll Dressing Contest. Mrs. Clara Batten, chairman of the committee in charge of purchasing a new banner, has been authorized to purchase same as soon as possible. 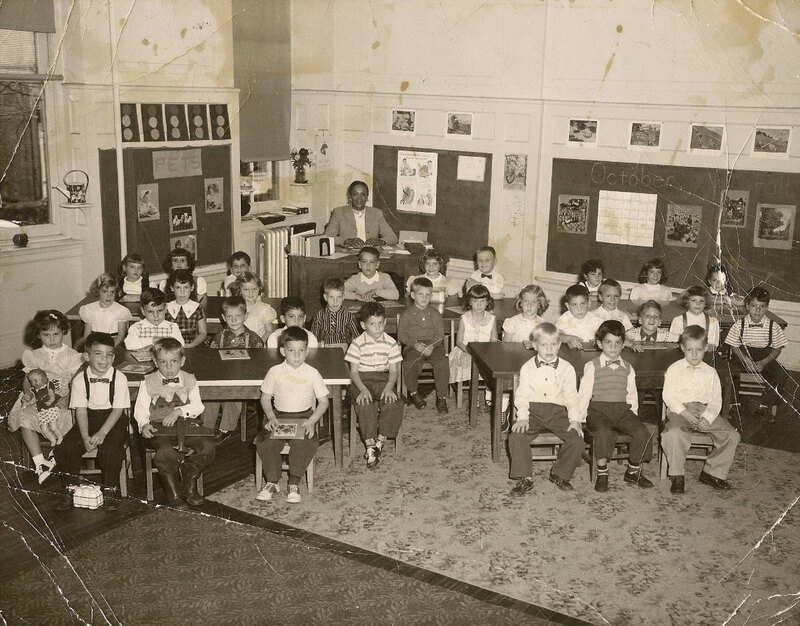 Mrs. Florence Fiedler, newly appointed summer round-up chairman, is making plans for a thorough survey of the school neighborhood in order to enlist the aid of the parents of preschool children. Founders' Day exercises will be held tonight at the meeting. McKinley—Harry Roye will speak at the meeting next Tuesday night. There will also be a Founders' Day ceremony. Those taking part will rehearse Friday at 3.30 a. m. at the school. Mrs. Rudolph Koerner will hold a study group meeting at her home next Wednesday at 2.00 p. m. Next Thursday a covered dish luncheon will be held by Mrs. R. Koerner and Mrs. Morris Sellers at the home of Mrs. R. Koerner, Fremont and Thirty-fifth street. On Thursday a meeting on character education will be held at the school at 3.30 p. m. Miss Alice Butler, general secretary of the Y. W. C. A., fill speak. Parkside—Mrs. Robert Simmington, council chairman, and Mrs. Rocco Palese, city chairman, gave brief talks at the meeting last Thursday night. Corsages were presented to them by Mrs. Sinclair Sondie, program chairman. Proceeds from the sale of a cake will be sent as a Founders' Day gift to he National Congress to be used or extension work. North-East & Sewell — Mrs. Grace Dill, discussion group leader, attended the meeting in City Hall Monday under the direction of Miss Mary Leaming, home demonstration agent. A meeting of the discussion group was held in the Sewell school on Tuesday afternoon. 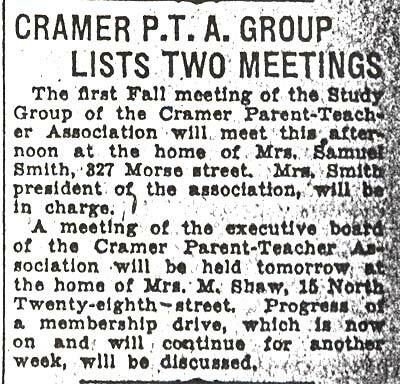 Sumner—The ways and means committee met at the home of Mrs. Grace Thomas, president, on Monday. Plans for various entertainments for the months of February, March and April were made. A membership campaign was launched. The topic of discussion at the meeting on Wednesday was "How the School Prepares for Home and Family Life." H. C. Sharp—The regular meeting was held Friday. Gordon Carrigan presided. The Rev. Eric A. Osterle of Collingswood. discussed "Youth Problems." "Founders' Day" was observed, also the ninth birthday of this unit. A large birthday cake was lighted by the past presidents, and a large candle lighted by Miss Ethel Lee for Founders Day. Miss Lee was congratulated for her wonderful co-operation with all presidents and P.T.A. work; and was presented with a corsage of red roses. Each president in turn was presented with a red rose bud boutonniere by Miss Esther Bauer, who had charge of the program, assisted by Miss Maier and Mrs. Barton. Each president gave a "Reminiscent" of his service. They were as follows: Chester Knaub, Harry Krattenmaker, Herman Neissner, Gordon Carriean, Howard Stewart, Raymond Price. Washington — Rev. E1wood A. Harrar spoke Tuesday at the Founders Day meeting Tuesday. Mrs. Howard Weeden, city juvenile probation chairman, was guest speaker. Miss Charlotte V. Dover, former principal of the school, was also a guest. A brief history of the association were called upon to speak. John White was the first president. 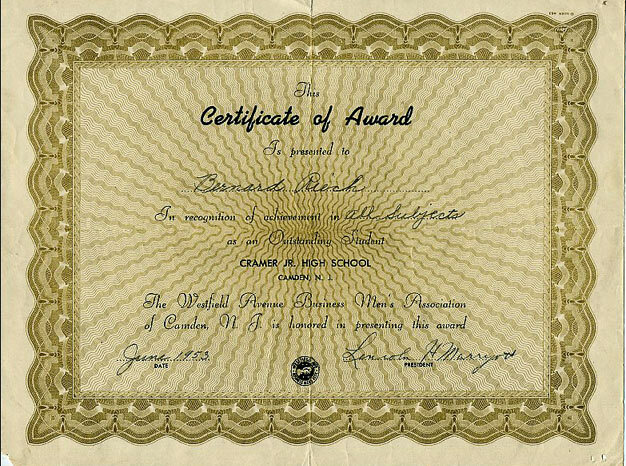 He was followed by Jacob Grosmick, Mrs. Wilbur Cassedy, and the present president, Mrs. Richard Baker. Mrs. F. Kau ff man reports the cake sale a success. 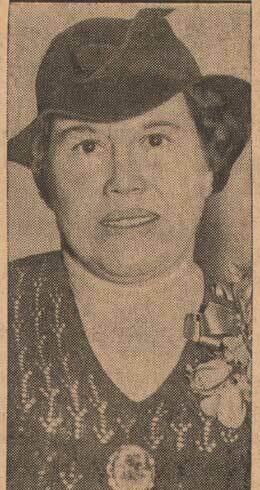 Mrs. William Mitchell reported plans to form a First Aid class that will be given a course by the Red Cross. H. B. Wilson—Plans were made for the Founders Day program at the executive committee meeting Thursday afternoon in the school. Mrs. Lawrence Miller was named chairman. Miss Harriet Reiners will speak on character education at the next meeting. The basketball team was furnished with suits by the unit. Yorkship—After a short business session with Mrs. James L. Ferris presiding, the monthly meeting was turned over to Mrs. J. P. McMillion, county chairman of alcohol and narcotics. Rev. H. S. Lepperd, of Fairview M. E. Church, spoke. Mrs David Pyper, chairman of ways and means, announced plans for a care party to be held on February 18. Proceeds will be used for expenses to carry on the monthly dances and Annual Field Day. The discussion group met today in teachers lunch room. Mrs. Malcolm Steck, leader, will use as a topic "What Interests Adolescence." As a special feature for the monthly dances the organization has arranged to have a half hour of dancing instructions before the regular dancing begins. Attending the city group meeting at City Hall were Mrs. James L. Ferris, president; Mrs David Pyper, Mrs. M. Johnson, Mrs. Eleanor Wynn, Mrs. W. Clemmens Mrs. George Mehaffey and Mrs. Harold Turner attended. Lincoln—Dr. Helen Schrak gave a talk on health and a report on health conditions of the children of this school at the last meeting. A Founders Day sketch was presented by Mrs. M. Beaumont, Mrs. G. Welmrich, Mrs. E. Schelpat and Mrs. K Conlin. The Queen Esther Circle of the Asbury M. E. Church will present "Here Comes Charlie," a three-act comedy, in the Cramer school auditorium tonight at 8 o'clock, under sponsorship of the Cramer School P.T.A. Robert Barrar coached the production. The cast comprises John Kissel, Dorothy Crowell, Frank Crovvell, Frances Allenback, Robert Brasher, Ruth Selfridge, Ethel Lingenfelter, George Gardner and James Parker. 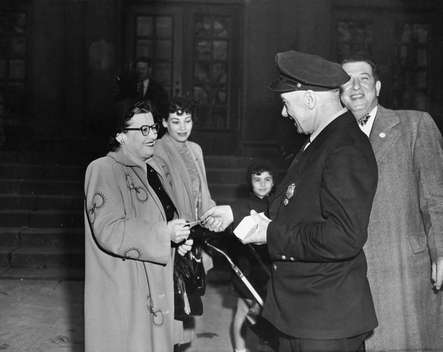 Undated 1949 photo showing William Comerford, driver for Camden's fire chief, passing out circulars to recruit support for police and fireman pay raises in front of the Alfred Cramer School. The schools represent eight public arid one parochial school in. 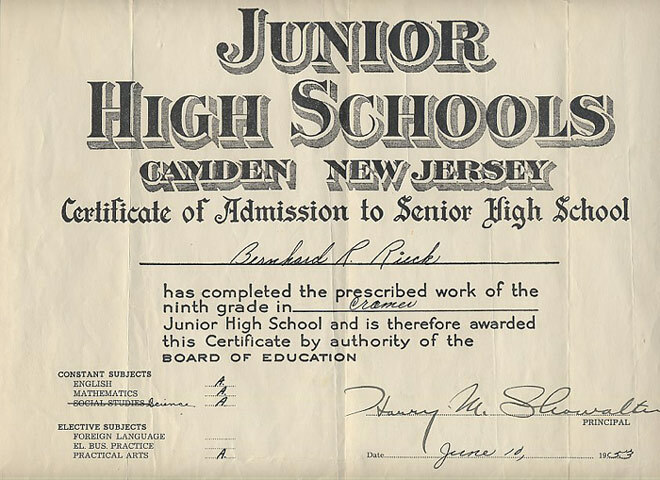 Cam­den and the Pennsauken Township Junior High School. The Camden county competition is part of the an­nual marbles tournament sponsored by The Inquirer. Champions were developed yesterday at the Pennsauken School, which registered a total of 41 boys and eight girls in its first years competition. Robert Barroway, 11, of 5303 Sherwood Terrace, and Vera Polk,12, of 3466 Gladwyn Avenue, both seventh-grade Pennsauken students, captured the titles. Camden school champions are Albert Colsey, 12, of 2807 Cleveland Avenue; and Iola Brooks, 13, of 2728 Garfield Avenue, of the Harry C. Sharp School, 32nd Street and Hayes Avenue; James Twyman, 13, of 807 Chestnut Street, winner at Whittier School, 8th and Chestnut Streets; Michael Marto, 14, of 215 Sewell Street; of the Cramer Junior High School, 29th and Mickle Streets; Alfred Medley, 13, of 1177 Lawrence Street, of the Powell School, 10th and Linden Streets. Also, Nicholas Martell, 13, of 1041 North 31st Street, brother of last year's Camden champion, and Arlene. 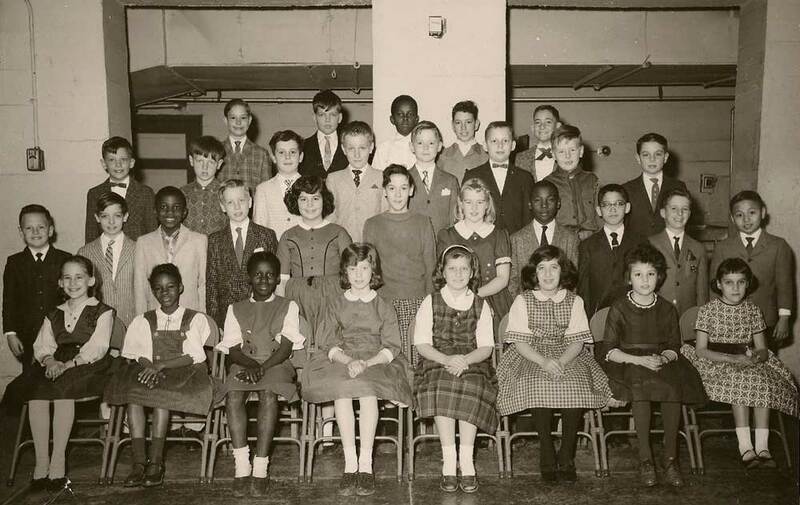 Fallon, 13, of 811 North 28th Street, both of Veterans' Memorial Junior High School, 26th Street and Hayes Avenue; Ronald Rowan, 51 North Street, champion of the Holy Name Parochial School, 5th and Vine Streets, competing ·for the first time this year; Ann Coles, 13, of 697 Van Hook Street, girl winner at the Mickle School, 6th and Van Hook Streets, and Stephen Trout, 14, of 305 Beideman Avenue, representing the Davis School, 34th and Cramer Streets. Also Whittier School, Edward DeGrilla, 14, of 732 Chestnut Street; Davis School, Robert Kerby, 13; Holy Name School, Samuel Montanez. 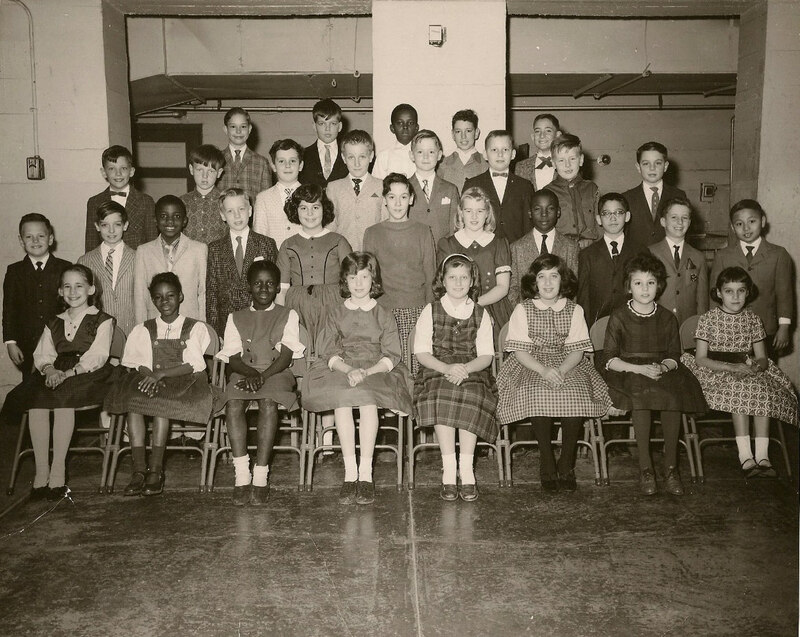 13, of 621 Cedar Street; Powell School, Sterling Davis, 13, of 323 North 11th Street, and Veterans School. Herbert Betts, 14, of 1155 Bergen Street and Judith Arensberg, 13, of 2730 Garfield Avenue.